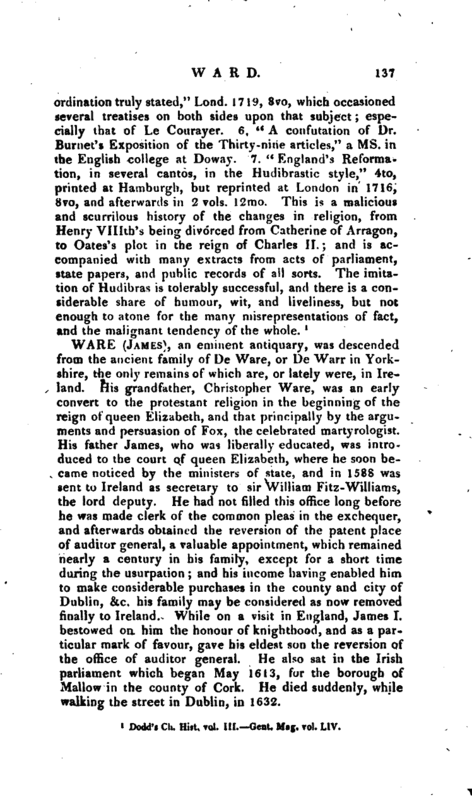 , an eminent antiquary, was descended from the ancient family of De Ware, or De Warr in Yorkshire, the only remains of which are, or lately were, in Ireland. His grandfather, Christopher Ware, was an early convert to the protestant religion in the beginning of the reign of queen Elizabeth, and that principally by the arguments and persuasion of Fox, the celebrated martyrologist. His father James, who was liberally educated, was introduced to the court of queen Elizabeth, where he soon because noticed by the ministers of state, and in 1588 was sent to Ireland as secretary to sir William Fitz-Wiiliams, the lord deputy. He had not filled this office long before he was made clerk of the common pleas in the exchequer, and afterwards obtained the reversion of the patent place of auditor general, a valuable appointment, which remained nearly a century in his family, except for a short time during the usurpation; and his income having enabled him to make considerable purchases in the county and city of Dublin, &c. his family may be considered as now removed finally to Ireland. While on a visit ui E;i^l md, James I. bestowed on him the honour of knighthood, and as a particular mark of favour, gave his eldest son the reversion of the office of auditor general. He also sat in the Irish parliament which began May 1613, for the borough of Mallow in the county of Cork. He died suddenly, while walking the street in Dublin, in 1632. | By his lady, Mary, sister of sir Ambrose Briden, of Maidstone in Kent, he had five sons and five daughters. 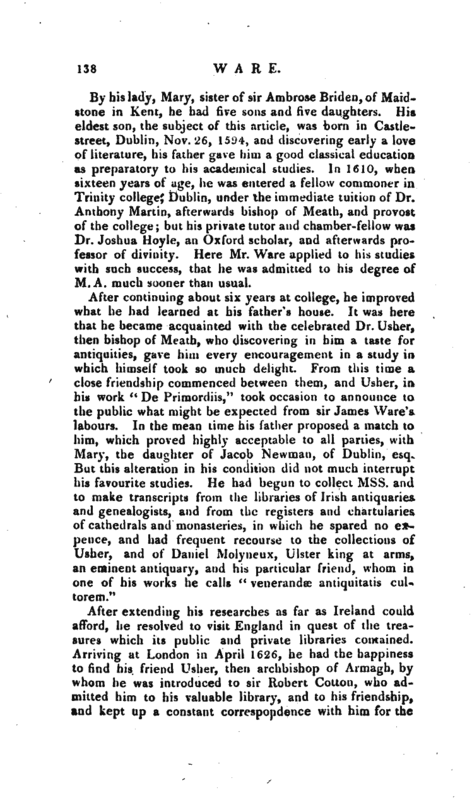 His eldest son, the subject of this article, was born in Castlestreet, Dublin, Nov. 26, 1594, and discovering early a love of literature, his father gave him a good classical education as preparatory to his academical studies. In 1610, when sixteen years of age, he was entered a fellow commoner in Trinity college, Dublin, under the immediate tuition of Dr. Anthony Martin, afterwards bishop of Meath, and provost of the college; but his private tutor and chamber-fellow was Dr. Joshua Hoyle, an Oxford scholar, and afterwards professor of divinity. 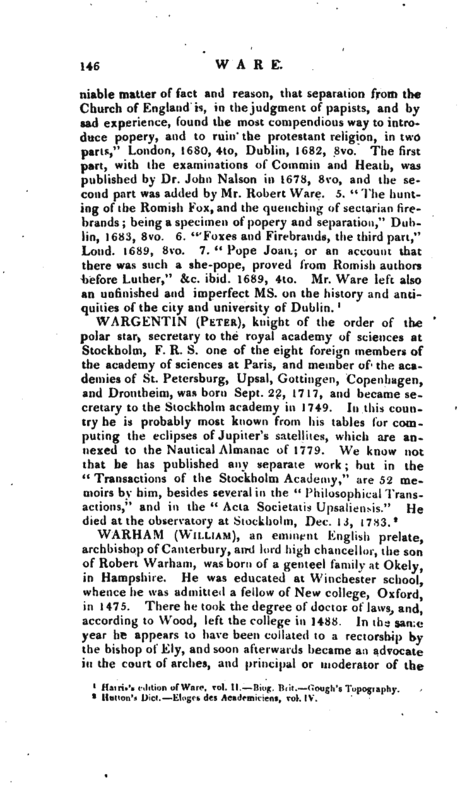 Here Mr. Ware applied to his studies with such success, that he was admitted to his degree of M. A. much sooner than usual. After extending his researches as far as Ireland could afford, he resolved to visit England in quest of the treasures which its public and private libraries contained. Arriving at London in April 1626, he had the happiness to find his friend Usher, then archbishop of Armagh, by whom he was introduced to sir Robert Cotton, who admitted him to his valuable library, and to his friendship, and kept up a constant correspondence with him for the | five remaining years of his life. 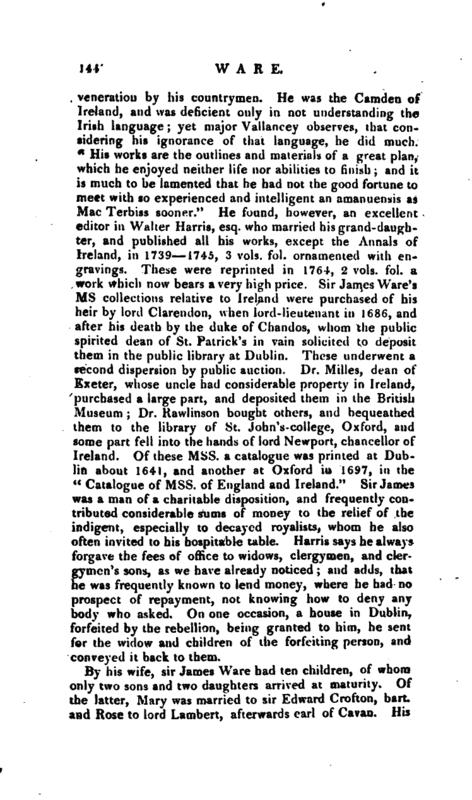 Having furnished himself with many materials from the Cotton collection, the Tower of London, and other repositories (many of which, in his hand-writing, are in Trinity college library) he returned with Usher to Ireland, and immediately published a tract entitled “Archiepiscoporum Cassiliensium et Tuamensium Vitae, duobis expressae commentariolis,” Dublin, 1626, 4to; and two years after, “De prttsulibus Lageniae, sive provincise Dubliniensis, lib. unus,” ibid. 1628, 4to, both which he afterwards inserted in his larger account of the Irish bishops. About the same time he published “Ccenobia Cistertiemia Hi hernia;,” which was afterwards included in his “Disquisitiones de Hibernia.” In the latter end of 1628 he went again to England, and carried with him some Mss. which he knew would be acceptable to sir Robert Cotton: and in this second journey added considerably to his own collections, by his acquaintance with Selden and other men of research and liberality. About the end of the summer 1629 he returned home, and soon after received the honour of knighthood from the hands of the lords justices. His talents were not more valued by Strafford, than by | the whole body of the clergy. When the two houses of convocation in Jan. 1634 petitioned his majesty, and the lord-deputy, for the settlement of some impropriations in the possession of the crown on a resident clergy, they annexed a schedule of particulars to their petition, setting forth a true state of what they requested. Lest the crown should be deceived in the matters prayed for, they requested that the same should be referred to some able commissioners therein named to examine the contents of the schedule; of whom they desired that sir James Ware should be one, which was accordingly granted, and a report made in their favour. Of the clerical character, sir James held an opinion equally just and humane, for in his office of auditor-general, he always remitted the fees to clergymen and their widows. In 1639, notwithstanding the hurry of public business, he published “De Scriptoribus Hiberniae, lib. duo,” Dublin, 4to. It is unnecessary to say much of this outline of the history of Irish writers, as it has since been so ably translated, enlarged, and improved by Mr. Harris, forming nearly a half of his second folio. 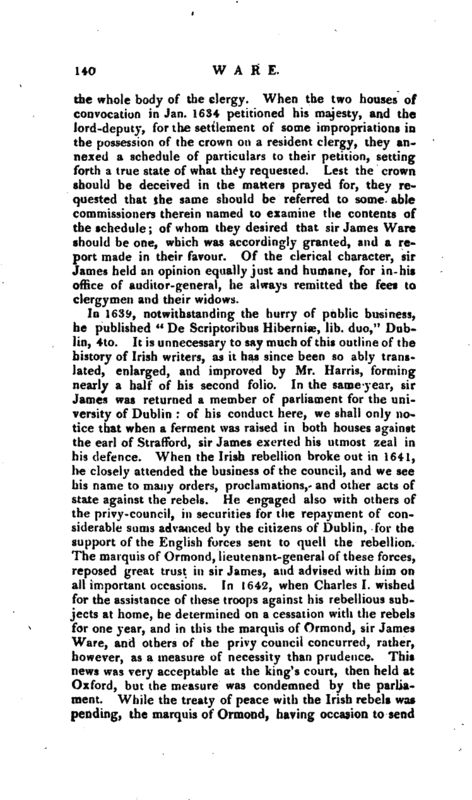 In the same year, sir James was returned a member of parliament for the university of Dublin: of his conduct here, we shall only notice that when a ferment was raised in both houses against the earl of Stratford, sir James exerted his utmost zeal in his defence. When the Irish rebellion broke out in 1641, he closely attended the business of the council, and we see his name to many orders, proclamations, and other acts of state against the rebels. He engaged also with others of the privy-council, in securities for the repayment of considerable sums advanced by the citizens of Dublin, for the support of the English forces sent to quell the rebellion. The marquis of Ormond, lieutenant-general of these forces, reposed great trust in sir James, and advised with him on all important occasions. In 1642, when Charles I. wished for the assistance of these troops against his rebellious subjects at home, he determined on a cessation with the rebels for one year, and in this the marquis of Ormond, sir James Ware, and others of the privy council concurred, rather, however, as a measure of necessity than prudence. This news was very acceptable at the king’s court, then held at Oxford, but the measure was condemned by the parliament. 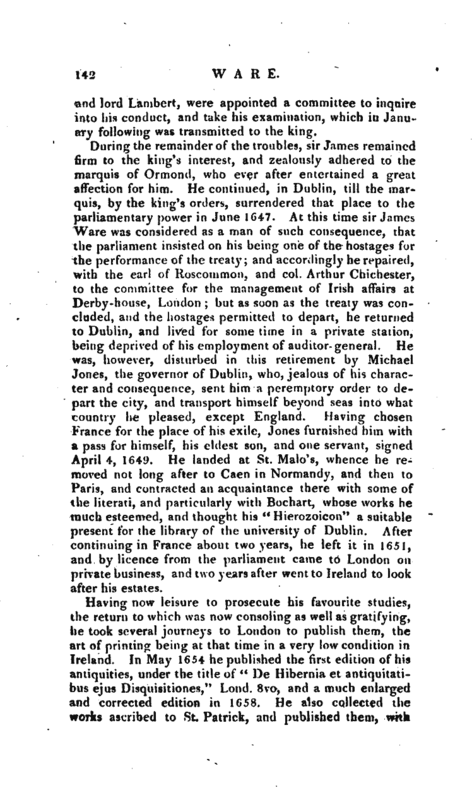 While the treaty of peace with the Irish rebels was pending, the marquis of Ormond, having occasion to send | some person* in whom he could confide to the king at Oxford, to inform his majesty of the posture of his affairs in Ireland, and to know his pleasure in relation to those particulars of the treaty which remained to be adjusted, fixed upon lord Edward Brabazon, sir Henry Tichborne, and sir James Ware, as persons acceptable to the king, and not inclined to favour either the popish or parliamentary interest. They arrived at Oxford in the end of 1644, and, while here, such time as sir James could spare from the business on which he was sent, was employed by him in the libraries, or in the company of the men of learning. The university complimented him with the honorary degree of doctor of laws. While these commissioners were returning to Ireland, they were taken by one of the parliament ships, and sir James, finding there were no hopes of escaping, threw overboard his majesty’s dispatches to the marquis of Ormond. He and his companions were then brought to London and imprisoned ten months in the Tower, but were at last released, in exchange for some persons imprisoned in Dublin, for an attempt to betray the town of Drogheda to fche Scotch covenanters. During his tedious imprisonment, sir James amused himself by writing “An imaginary voyage to an Utopian island,” which was never published, but the ms. remained for many years in the family. When discharged he returned to Dublin, and had an order from the lord-lieutenant and council on the treasury for 7 Is/, for the expences of his journey. As the king’s affairs now became desperate in both kingdoms, he sent instructions to the marquis of Ormond to make peace with the Irish catholics “whatever it cost, so that his protestant subjects there may be secured, and his regal authority preserved.’ 7 In what manner this was to be effected belongs to the history of the times. It was on the part of Charles an unfortunate measure, but it was thought a necessary one. Peace was accordingly concluded with the catholics by the earl of Glamorgan, whose conduct in the affair has been well illustrated by Dr. Birch in his” Inquiry into the share king Charles 1. had in the Transactions of the earl of Glamorgan," Lond. 1747 and 1756, 8vo. In the mean time Glamorgan being thought to have exceeded his commission, secretary Digby then in Ireland, accused him at the cpuncil-tabie, Dec. 26, 1645, of suspicion of treason. He was then arrested, and sir James, the earl of Roscoinmon, | and lord Lambert, were appointed a committee to inquire into his conduct, and take his examination, which in January following was transmitted to the king. “During the remainder of the troubles, sir James remained firm to the king’s interest, and zealously adhered to the marquis of Ormond, who ever after entertained a great affection for him. He continued, in Dublin, till the marquis, by the king’s orders, surrendered that place to the parliamentary power in June 1647. At this time sir James Ware was considered as a man of such consequence, that the parliament insisted on his being one of the hostages for the performance of the treaty; and accordingly he repaired, with the earl of Roscommon, and col. Arthur Chichester, to the committee for the management of Irish affairs at Derby-house, London; but as soon as the treaty was ‘concluded, and the hostages permitted to depart, he returned to Dublin, and lived for some time in a private station, being deprived of his employment of auditor- general. He was, however, disturbed in this retirement by Michael Jones, the governor of Dublin, who, jealous of his chafacter and consequence, sent him a peremptory order to depart the city, and transport himself beyond seas into what country he pleased, except England. Having chosen France for the place of his exile, Jones furnished him with a pass for himself, his eldest son, and one servant, signed April 4, 1649. He landed at St. Malo’s, whence he removed not long after to Caen in Normandy, and then to Paris, and contracted an acquaintance there with some of the literati, and particularly with Bochart, whose works he much esteemed, and thought his” Hierozoicon" a suitable present for the library of the university of Dublin. After continuing in France about two years, he left it in 1651, and by licence from the parliament came to London on private business, and two years after went to Ireland to look after his estates. Having now leisure to prosecute his favourite studies, the return to which was now consoling as well as gratifying, he took several journeys to London to publish them, the art of printing being at that time in a very low condition in Ireland. In May 1654 he published the first edition of his antiquities,. under the title of “De Hibernia et antiquitatibus ejus Disquisitiones,” Loncl. 8vo, and a much enlarged and corrected edition in 1658. He also collected the works ascribed to St. Patrick, and published them, with | notes, under the title “Opuscula Sancto Patrieio, qui Hibernos ad fidein Christi convertit, adscripta, &c.” Lond. 1656, 8vo. On the restoration, he was, by special order from his majesty, repla ed in his office of auditor-general, and a parliament beiug summoned in May 1661, he was unanimously elected representative oPthe university of Dublin. He was very instrumental in the parliamentary grant of 30,000l. to the marquis, now duke, of Ormond, who distinguished him in a very particular manner. By his grace’s interest, he was made one of the fourcommissioners of appeal in causes of the excise, and new impost raised by the statute of 14th and 15th Charles II. with a salary of 150l. He was also appointed one of the commissioners for the execution of the king’s declaration for the settlement of the kingdom, and for the satisfaction of the several interests of adventurers, soldiers, and others, and was, by the king’s instructions, made of the quorum in this commission, without whose presence and concurrence no act could be done in execution of the declaration. 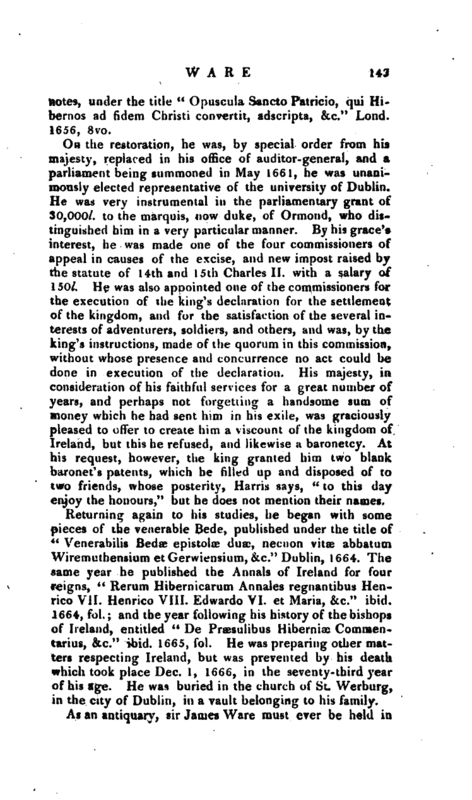 His majesty, in consideration of his faithful services for a great number of years, and perhaps not forgetting a handsome sum of money which he had sent him in his exile, was graciously pleased to offer to create him a viscount of the kingdom of Ireland, but this he refused, and likewise a baronetcy. At his request, however, the king granted him two blank baronet’s patents, which he filled up and disposed of to two friends, whose posterity, Harris says, “to this day enjoy the honours,” but he does not mention their names. Returning again to his studies, he began with some pieces of the venerable Bede, published under the title of “Venerabilis Bedae epistolae duae, necnon vitae abbatum Wiremuthensium etGerwiensium, &c.” Dublin, 1664. The same year he published the Annals of Ireland for four reigns, “Rerum Hibernicarum Annales reguantibus Henrico VII. Henrico VIII. Edwardo VI. et Maria, &c.” ibid. 1664, fol. ; and the year following his history of the bishops of Ireland, entitled “De Praesulibus Hiberniae Comiaestarius, &c.” ibid. 1665, fol. He was preparing other matters respecting Ireland, but was prevented by his death which took place Dec. 1, 1666, in the seventy-third year of his age. He was buried in the church of St. Werburg, in the city of Dublin, in a vault belonging to his family. As an antiquary, sir James Ware must ever be held in | veneration by his countrymen. He was the Camden of Ireland, and was deficient only in not understanding the Irish language; yet major Vallancey observes, that considering his ignorance of that language, he did much. “His works are the outlines and materials of a great plan, which he enjoyed neither life nor abilities to finish; and it is much to be lamented that he had not the good fortune to meet with so experienced and intelligent an amanuensis as Mac Terbiss sooner.” He found, however, an excellent editor in Walter Harris, esq. who married his grand-daughter, and published all his works, except the Annals of Ireland, in 1739 1745, 3 vols. fol. ornamented with engravings. These were reprinted in 1764, 2 vols. foi. a work which now bears a very high price. 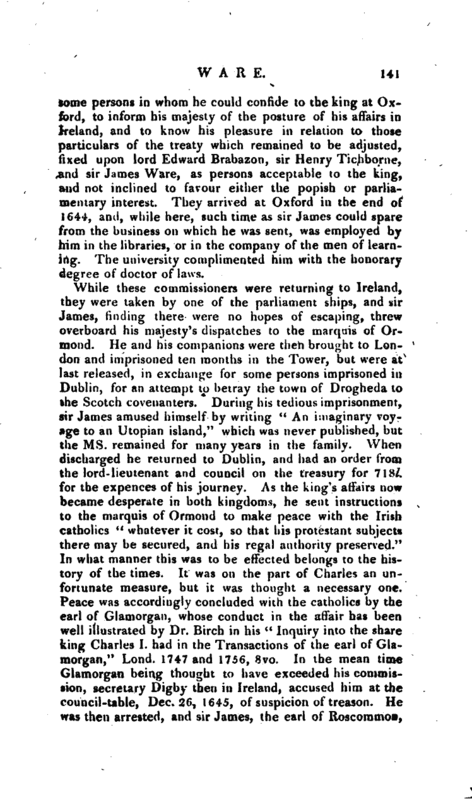 Sir James Ware’s ms collections relative to Ireland were purchased of his heir by lord Clarendon, when lord-lieutenant in 1686, and after his death by the duke of Chandos, whom the public spirited dean of St. Patrick’s in vain solicited to deposit them in the public library at Dublin. These underwent a second dispersion by public auction. Dr. Milles, dean of Exeter, whose uncle had considerable property in Ireland, purchased a large part, and deposited them in the British Museum; Dr. Rawlinson bought others, and bequeathed them to the library of St. John’s-college, Oxford, and some part fell into the hands of lord Newport, chancellor of Ireland. Of these Mss. a catalogue was printed at Dublin about 1641, and another at Oxford in 1697, in the “Catalogue of Mss. of England and Ireland.” Sir James was a man of a charitable disposition, and frequently contributed considerable sums of money to the relief of the indigent, especially to decayed royalists, whom he also often invited to his hospitable table. Harris says he always forgave the fees of office to widows, clergymen, and clergymen’s sons, as we have already noticed; and adds, that he was frequently known to lend -money, where he had no prospect of repayment, not knowing how to deny any body who asked. On one occasion, a house in Dublin, forfeited by the rebellion, being granted to him, he sent for the widow and children of the forfeiting person, and conveyed it back to them. By his wife, sir James Ware had ten children, of whom only two sons and two daughters arrived at maturity. Of the latter, Mary was married to sir Edward Crofton, bart. 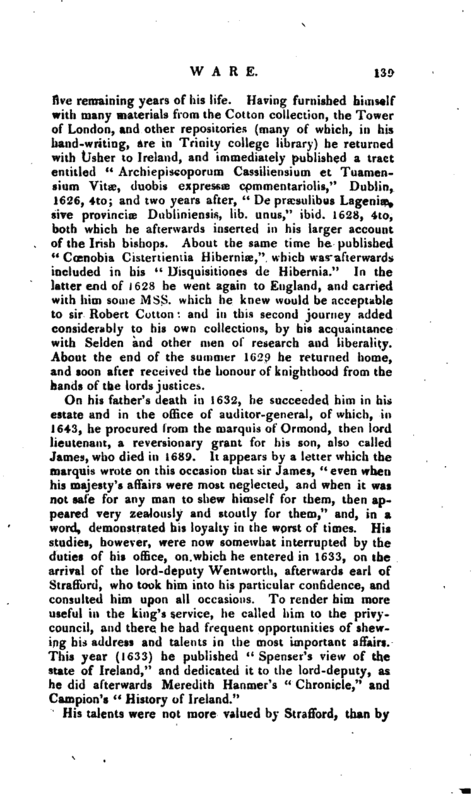 and Rqse to lord Lambert, afterwards earl of Cavan. His | eldest son James succeeded him in his estate and office, and married the daughter of Dixie Hickman, of Kew, in the county of Surrey, esq. and sister to Thomas lord Windsor, who was afterwards created earl of Plymouth. By a general entail raised on this marriage, the estate of the family afterwards came to an only daughter, Mary, who took for her second husband sir John St, Leger, knt. one of the barons of his majesty’s court of exchequer in Ireland, in whom the estate vested. Sir James Ware’s youngest son Robert was in his youth troubled with epilepsy, and afforded no hopes to his father, which induced him to consent to the general entail before mentioned; but this son afterwards recovering a vigorous state of health, sir James had little pleasure in reflecting on what he had done, and to make Robert every amends in his power, laid up 1000l. for every remaining year of his life, which was not above six or seven. Robert married Elizabeth, daughter to sir Henry Piers, of Tristernagh, in the county of Westmeath^ bart. and from this marriage one only son, Henry, survived. Henry married Mary, the daughter of Peter Egerton, of Shaw, in Lancashire, esq. by whom he had two sons, and a daughter Elizabeth, married to Walter Harris, esq. 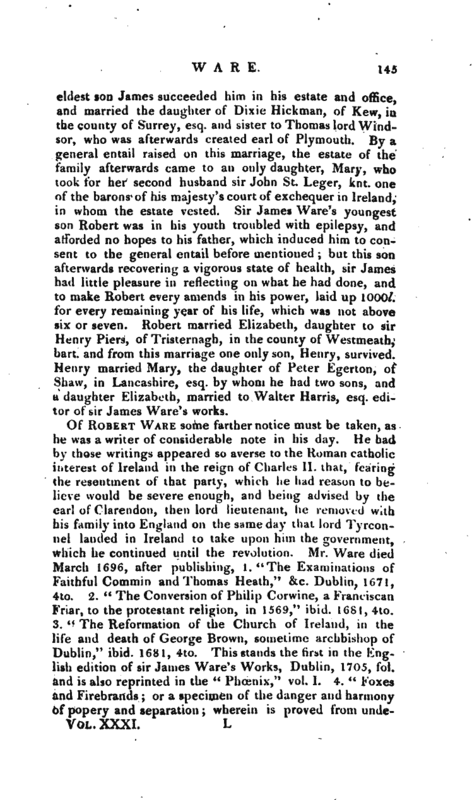 editor of sir James Ware’s works.